The Xbox One is the least popular platform among indies, according to a developer survey carried out at EGX Rezzed this year by GamesIndustry.biz. 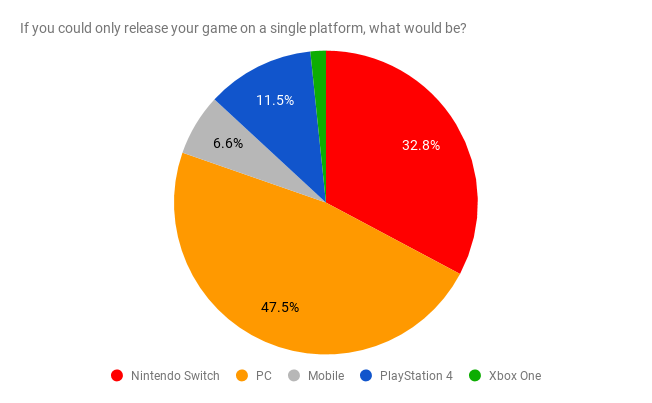 Of the 61 developers surveyed, PC was the favourite with 47.5 per cent stating that would be their preference if they could release on any single platform. Although the sample size isn't large enough to provide any conclusive evidence, the scope of developers surveyed is wide enough to act as a rough barometer for certain trends and preferences, providing a leaping off point for future investigation. Despite having the lowest install base, the Nintendo Switch was the second-most popular choice with 32.8 per cent, followed by PlayStation 4 with 11.5 per cent. Mobile and Xbox One came in as least preferable for indie developers with 6.6 per cent and 1.6 per cent respectively. However, none of our respondents chose to comment on why these platforms ranked so low for them, instead opting to discuss the benefits of the devices they preferred. It is, of course, easier than ever for indies to ship games on multiple platforms, particularly as the leading engines support all platforms and some - such as Xbox One and PlayStation 4 - share similar architectures. Nevertheless, it appears the developers we spoke to would opt for Sony's console over Microsoft's if they had to make a choice. While many developers were quick to note the "overcrowding" and "saturation" of Steam, PC remained the most popular among developers for obvious reasons; it's an open platform that's easy to release on, and it has a large audience of enthusiastic indie gamers. One developer noted that PC gamers typically like to trial new and experimental content more than consumers on other platforms. "It's the perfect platform for serious devs looking to build the best game in their genre," said another. "Free community building, free bug testing, free game dev consulting. There's very little not to like about working on PC at the moment." Developers found the Switch an attractive proposition based on a lot of varying factors. Several noted the curated Nintendo Eshop, while others viewed the Switch as having the healthiest market at present with a broad consumer demographic. "Currently the Switch is the only platform where the race to the bottom on price hasn't really happened yet," said one developer. "We are releasing on PC first though, and expanding to other platforms later if it's sufficiently successful as it is easier to develop for." Other developers said they were designing for the Switch first as it presents the "biggest opportunity for indies right now". The novelty, "innovative features", and continued excitement around the Switch -- along with the perceived success of indie titles on the platform -- also attracted developers. For VR developers however, the PlayStation 4 presented an attractive proposition thanks to the higher install base of PSVR over high-end PC headsets such as the HTC Vive or Oculus Rift. Although Sony doubled-down on indie games with the PlayStation 4, developers aren't enamoured with the platform. That said, many were quick mention the support offered by Sony to indie developers, and expressed an appreciation for the curated store. Regarding the Xbox, one developer said it was a hard choice between Microsoft's platform and the Switch, but that Xbox is "easier to deal with". This sentiment was echoed by other developers on the show floor who wanted to release on Switch, but opted for other platforms. Other information gleaned from the survey shows that crunch culture remains present among indie developers, despite the recent public backlash against it from developers at studios both large and small. Of those surveyed, over half said they crunch on their own game with the average developer working 62 hours a week during periods of crunch. Overall, indie devs are crunching hours on par with their AAA counterparts, with six respondents saying 70 hours was an acceptable level, and three going as high as 80 hours. 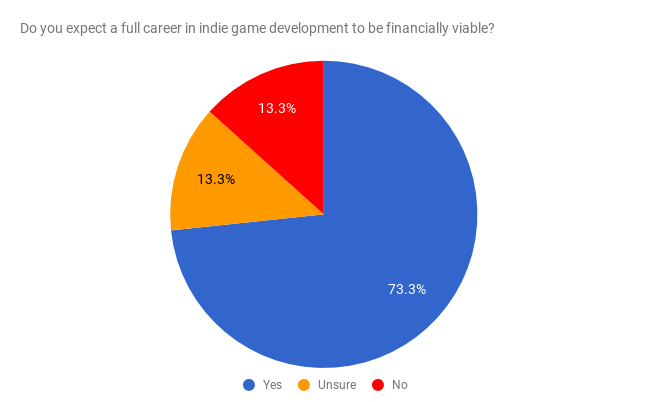 Despite this, indie developers remain optimistic on the whole with 73.3 per cent considering a full career in the sector as financially viable. In comparison, only 13.3 per cent of respondents didn't think it was possible, while the same amount again were unsure. Even in a worst case scenario and a career in indie development doesn't pan out, 65.6 per cent of respondents were committed to staying in the games industry, with only 11.5 per cent saying they would leave. As with last week's article on the biggest challenges facing indie developers in 2018, the lack of oxygen available to them in an overcrowded PC market is a key concern. Even so, the accessibility of developing on PC, combined with the sheer size of the install base, makes it the preference for many. But can Nintendo, with its historically conservative approach to indie games, begin to siphon off the increasingly disenfranchised talent which defaults to PC development through convenience rather than desire? The new raft of indie titles appearing on the Switch, and the enthusiasm of indie developers for the platform itself, suggest it's a possibility.